It is difficult to comprehend the variety of uses of boron in construction, manufacturing, medicine, science, microelectronics, pharmaceuticals, telecommunications, space travel, communication satellites, specialty metals, battery technology and more! We could not survive without the element boron. It is found all around us and we are in constant contact with this vital element – even though we are, for the most part, not aware of it. Interestingly, economic occurrences of Boron are quite rare and large economic deposits exist in only a few places. Some common applications of boron include glass production, insulation, fertilizer, silicon, metallurgy, LCD screens, stealth technology, sports equipment, nuclear reactors and waste storage, lithium batteries, computers, heat shields and medicines. Boron can also be found in automotive products like motor oil, brake fluid, steering fluid and antifreeze. All plant life requires boron to grow. Boron is key to the flowering, pollen, seed and fruit development and germination itself. It also plays a major part in the production of sugar and carbohydrates within leaves and roots. Fertilizers also contain boron. It would not be possible to grow many crops, especially in areas where the natural occurrence of boron is low, without the addition of boron. Borate minerals and refined borate products are used extensively worldwide in the manufacture of vitreous products such as fiberglass insulation, textile fiberglass, borosilicate glass (e.g. LCD screens), ceramic glazes and porcelain enamels. These applications account for approximately 60 per cent of borate consumption, with detergents, fire retardants, metallurgy, agriculture, insecticides, wood preservatives and specialty products accounting for the remainder. World production reached 2.4 million tons B2O3 (>5 million tons mine run) in 2015 and is growing at a controlled pace (Source: RTM – Rio Tinto) China is the largest consumer of boron, where consumption has risen by 15% per year from 2000 to 2010 and is currently growing at their GDP growth rate of 7% (Source: US Geological Survey). The US market is the second largest, growing at a rate in excess of GDP growth, driven by housing recovery. Boron, the semi-metallic element with atomic number 5, does not occur in nature as free element. It occurs in the form of a natural mineral associated with other elements such as Na, Ca, and Mg. Among over 200 naturally occurring boron minerals, the most commercially important borates are: Tincal, Colemanite and Ulexite. About 80% of borates placed on the EU market are used in intermediate uses such as in the manufacture of glass & frits and/or for the synthesis of new substances, and in biocidal applications. In addition, boron is an essential micronutrient for normal, productive plant growth and is one of seven essential micronutrients for plants. 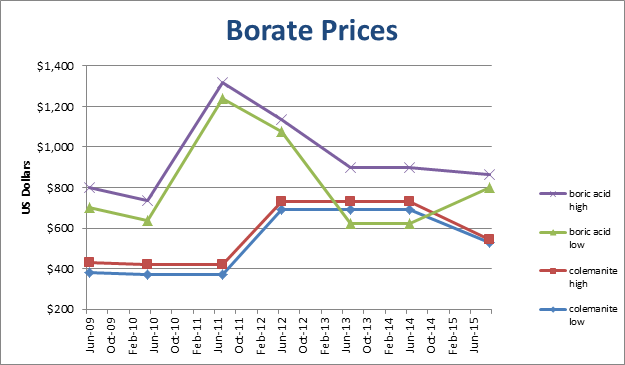 Borates prices decreased between 2008-2009 due to the global economic crisis. After 2010 market conditions stabilised again.